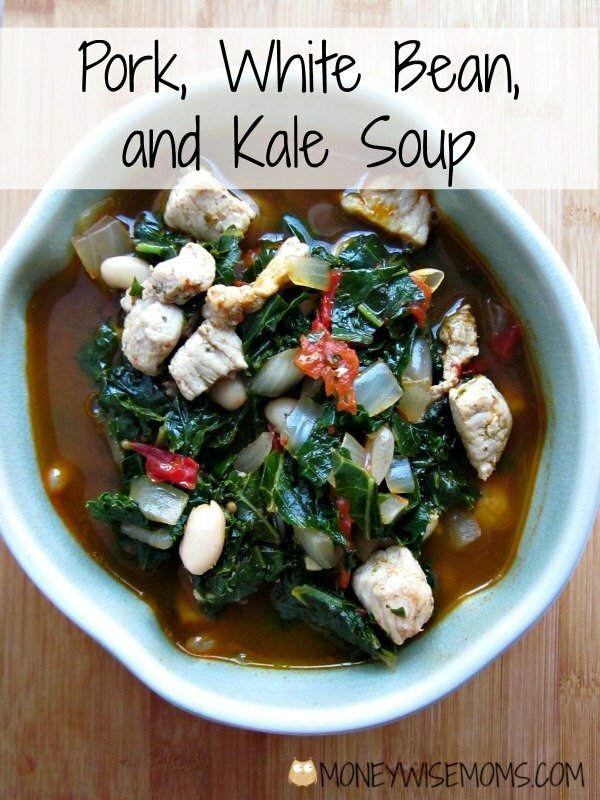 This Pork, White Bean and Kale Soup is an easy way to get a healthy meal on the table! 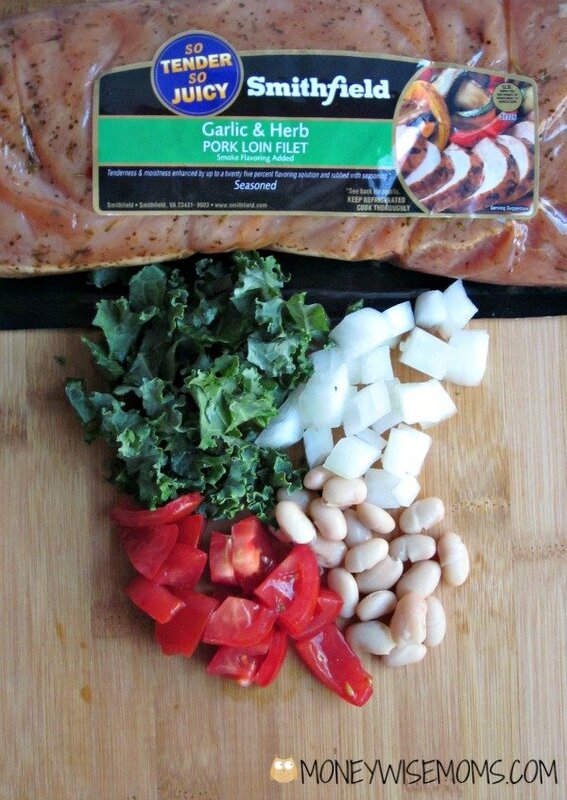 I picked up this Garlic & Herb Pork Loin Filet at Walmart. Since each package is about 3 lbs., I cut the roast in half and will cook the rest another night (easy dinner!). 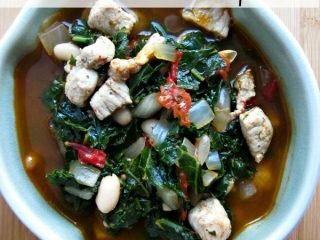 With the pork already marinated, I wanted to try this Pork, White Bean and Kale Soup recipe, adapted from Eating Well. Confession time! With all my healthy and “real food” eating, I have never tried kale, and I have never given it to the family. I’d heard that kale could be bitter, so I figured it would be great to introduce it to the family soaked in a delicious broth (and I was right!). When you want to put an easy, home-cooked meal on the table for your family, wholesome shortcuts can be a big help. Instead of remembering to defrost a roast and planning to marinate for hours, just pick up a Smithfield Marinated Pork. All seven varieties–like Mesquite Pork Loin, Portobello Mushroom Flavor Filet, and Peppercorn & Garlic Tenderloin–are so easy. You can WOW your family (or guests) and just grilling or baking via the directions on the package. It’s ready to go, as a timesaver and with no stress! The combination of textures in this soup is fantastic! The beans are smooth, soaking up the fragrant broth. The kale is lightly crunchy, which everyone enjoyed. The pork and onions have a little chew to them. I just love soups with lots of layers like this. As an added bonus, my house smelled amazing while this was cooking. Yum! The cooking time is short on this soup–so be sure and prep all your ingredients ahead of time. I had them lined up next to me at the stove, so I could keep stirring and just add them as needed. Heat oil in a large stock pot over medium-high heat. Add pork and cook until no longer pink on the outside, about 3-4 minutes. Transfer to a plate with tongs, leaving juices in the pot. Add onion to the pot and cook, stirring often, until just beginning to brown, 2 to 3 minutes. Add garlic, paprika and crushed red pepper and cook, stirring constantly, about 30 seconds. Add wine and tomatoes, increase heat to high and stir to scrape up any browned bits. Add broth and bring to a boil. Add kale and stir just until it wilts. Reduce heat to maintain a strong simmer and cook, stirring occasionally, until the kale is just tender, about 4 minutes. Stir in the beans and the reserved pork with its juices. Simmer until the beans and pork are heated through, about 2 minutes. My kids loved the texture of the kale once it soaked up the soup broth. It’s now their favorite way to eat kale! Recipe linked up to The SITS Girls, Weekend Bloggy Reading at Serenity Now, and Tasty Tuesdays at Creative K Kids. Looks amazing! May try this one day. I am all for quick and easy dinners and this looks amazing! I have never thought of cutting the roasts in half, I don’t know why, it’s such a great idea! 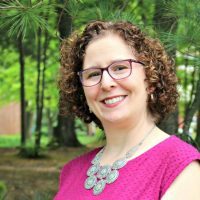 Thank you so much for joining us at Creative K Kids Tasty Tuesdays Link Party! I will be pinning this to the Tasty Tuesdays Board. Hope you can join us again next week!